I’ve spoken before about how I wonder what might happen if I were to return to traditional employment. How much of a shock would it be to my system? What would I have to do to help make it work for me again? An interesting discussion is taking place on this very issue over at Freelance Switch, following Raj Dash’s article Can Freelancers Return To Salaried Work. Raj raises some potential pitfalls that I’d not even considered, and as usual, the comments and experience-sharing in the comments section proves just as valuable as the (excellent) article itself. Worth checking out. Has anyone heard of experienced freelance translators who have returned to employment? Or any studies or articles looking into this? As new career structures go, portfolio careers are only slowly starting to get the airtime they deserve. Marci Alboher calls them slash careers, Michelle Goodman refers to them as patchwork paychecks – dressed up however you like, many of us are already living this way whether we realise it or not. Best of all, it’s a phenomenon that transcends the much-hyped generational gap and could see us all the way through the retirement. What’s not to love? Another portfolio career characteristic is that you’ll work at different rates. Some jobs will pay well and others won’t, but the lower-paying positions might be fun or offer intangible benefits, such as an opportunity to give back to your community. So where does being self-employed come into it? And are all freelancers portfolio workers? This is not just a CV-friendly way of describing those stretches when you’ve held down more than one part-time job, I’m afraid – student/waiter/bartender doesn’t really cut it. Even when employed, i.e. holding down a paid part-time position, portfolio workers are usually self-employed too. This may be by virtue of the kinds of roles they take on and/or for tax purposes. Ultimately, they have a greater degree of autonomy and control over their work and have made a conscious decision to make a career out of pursuing multiple income streams. So portfolio workers tend to be freelancers too, although depending on the degree of variety among their work providers, it can be said that freelancers are not necessarily portfolio workers. Normally, there are two camps. The first – shared by loaded downshifters and a certain type of gormless, grinning management expert – is that portfolio working is all about choice. They will tell you its about opting out of the soul-deadening rat race, doing your own thing, freedom, becoming ‘me plc’, and so on. The other camp – inhabited by melancholy economists and anxious liberals – is that portfolio work is better explained by lack-of-choice. Satisfactory employment options dip in certain sectors of the economy, and the lonely, itinerant ranks of portfolio workers witness a corresponding rise. In fact, in some quarters it’s even considered bad for your mortal soul. In a 2004 interview with the Times, the Archbishop of Canterbury linked portfolio working with an inability to hold down relationships and a lack of integrity, saying that it destroyed the quality of human interactions. Dramatic claims indeed, so don’t say you weren’t warned. It’s probably fair to say the reality is a little less black and white. Clearly, a portfolio career is not for everyone but for those who are prepared to make a go of it, it can mean a rewarding and satisfying career path whatever your age. 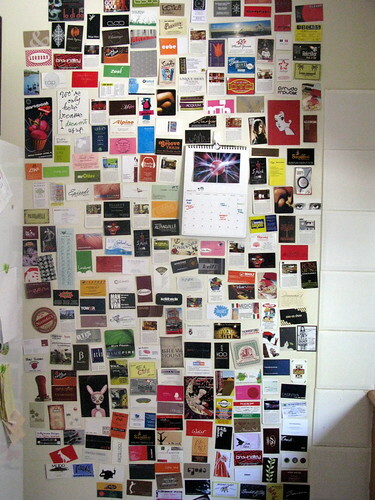 Thanks to sensesmaybenumbed on Flickr for the photo of the business card wall. Do Freelancers Do It Better? If you’re thinking about taking the plunge to freelance, or are currently freelancing and wondering why you ever thought it was a good idea (it happens…), then have a look at this article called 101 Reasons Freelancers Do It Better. Worth a read, whichever camp you fall into. It was only on re-reading my post that I detected some not-very-veiled criticism directed towards the freelance community in general, and its attitudes towards our cubicle-dwelling brethren. Am I justified in this? Hmm, something to explore in future posts perhaps. I’ve been reading lots of Web Worker Daily lately. If you’re serious about being a freelance translator, this blog will contain more useful information than all the translation sites in the world put together! (Oops, have I just shot myself in the foot with this recommendation?! No, just proved how genuinely I care for each and every one of my readers :)) Check it out, it’s great. How timely. Penelope Trunk has just posted some tips on how NOT to starve as a freelancer over on Brazen Careerist. Check it out – she’s talking about her experiences as a freelance writer, but I reckon every one of her points applies to freelance translators too.